The attraction of getting a gift voucher as largess for simply filling in a survey is a not uncommon marketing technique (as we have mentioned on this site several times in the past). However, the same technique is also being used by criminals to harvest personal details off users. Today we present two more such scam survey emails. The first scam email is as shown in Figure A. This one offers the recipient the chance to win a $50 Kmart voucher if they fill in a survey. The email contains links back to a site that is a suspected phishing site. The purpose of this email is to extract personal information from the recipient. 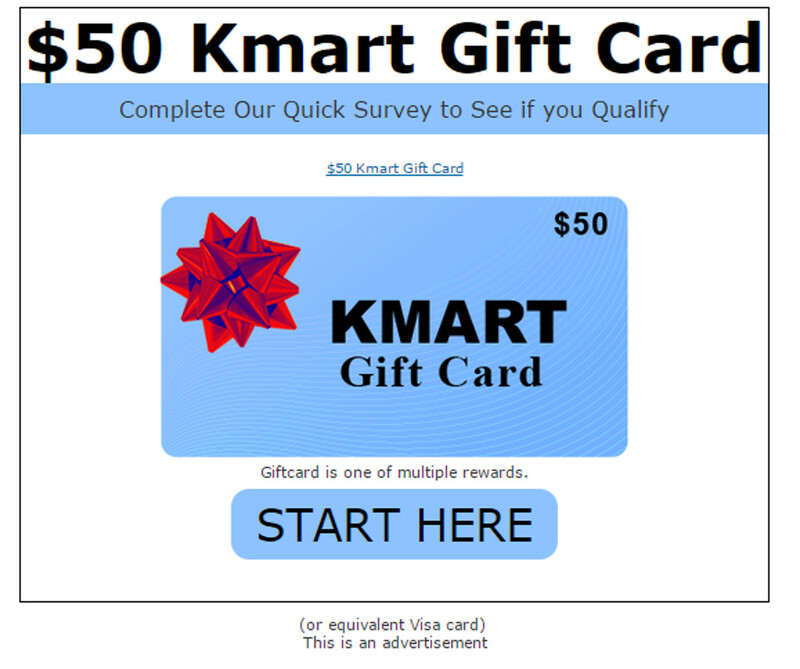 There are other indications that the email is not legitimate; the subject line of the email reads “Do you want a 50$ Kmart Gift Card?”, whilst the sender is listed as Super Euro Deals. The “$” is rather obviously in the wrong place for an English language sentence. Our second exhibit today is an email supposedly from Target. This survey email is treading a well-worn path with a simple question that will supposedly enter the recipient in a draw to win a %50 target voucher. The email is shown in Figure B. 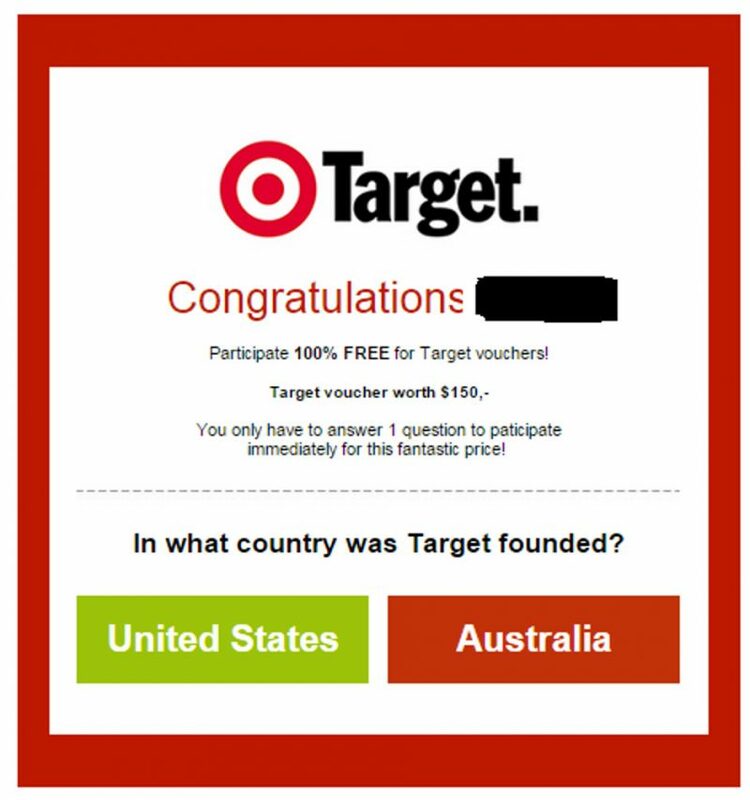 The subject line for this email reads “”Confirm your Target Voucher”, whilst the sender is listed simply as “Target”. This email is very similar to a previous Woolworths scam email that we posted on this site recently. In fact the emails are so similar that we suspect the same persons are involved in the Target phish. Once again, the Target email has a few signs that it is not legitimate. The grammar and general wording is not what we would expect from an official email. Whilst the email is personalised, mousing over the links shows that none of them lead back to a legitimate Target site. Finally, checking on the sender shows that it is not from the Target domain or an affiliated domain. If you receive either (or both) of these emails, delete them. They are phishing emails. Just received email from Target- “thankyou target reward- open immediately “, I just shopped there yesterday, is this a scam? Hi Karen. It’s very likely a scam. Could you possibly send it to [email protected] ? (with full headers if possible). which provides details on how to retrieve full header information from various email clients. Using the Message Header information, we can see where this email came from and which path it took to get to you. From there we should be able to let you know if the email was fake.